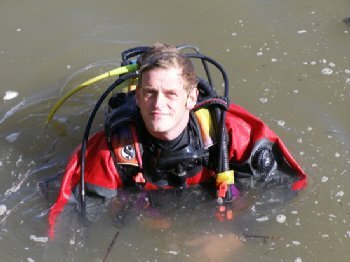 A University of Ulster diver has been exploring boats in underwater archaeology digs in a south-western Hungarian river. Rory McNeary, from the Centre for Maritime Archaeology at Coleraine, took part in a two-week field programme at an Ottoman period bridging site on the Drava River. The multi-national research project on the 16th and 17th century site was directed by the Hungarian National Office of Cultural Heritage. Rory, who is originally from Enniskillen, assisted in the hand excavation of a partially-exposed log boat, underwater dredge-pumping of a shipwreck mound and the recovery of ship timbers. He also took underwater stills and video photography and carried out a top-side sonar survey. He hopes to apply the expertise he has acquired in lakes and rivers back home. “Underwater archaeologists here have generally tended to overlook freshwater environments in favour of the marine,” said Rory. “This study affirmed my belief that there is considerable research still to be done in Ireland in terms of underwater freshwater archaeology. “This is something that is being addressed proactively at Ulster’s Centre for Marine Archaeology, with a current programme of research for NIEA, Built Heritage which examines the underwater archaeology of Northern Ireland’s lakes and rivers.